Still on the approach | sweet juniper! Wood is antsy. She doesn't know what to do with herself at home with us now that she's officially on maternity leave. "You don't want to keep playing SQUID CAVE?" Juniper and I ask, quite shocked. 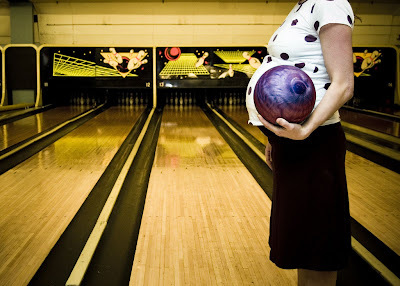 "Let's go bowling," she says, hoping all the strikes and gutters will somehow inspire her womb to evict its occupant. 39.4 weeks pregnant, and the woman manages to outscore me. Even the kid, with her crafty use of the bumper lanes and her 4-lb ball with its 2.12 MPH rolls, somehow also outscores me. Bowling never was my game, dude. Don't assume that our silence means anything. We'll post the second anything happens.